We have a comprehensive contact database of Thai abrasive companies, Thailand abrasive Manufacturers and abrasive products such as Abrasives and abrasive products that are used to remove surface materials such as metal, ceramics, glass, plastics, and paint. Abrasives and abrasive products include discs, belts, blast machines and sandblasters, as well as sheets, rolls, and hand pads. We can help you in sourcing all these products. Abrasive belts consist of abrasive grain adhered onto the surface of a cloth, film, paper, non-woven or other backing. Abrasive discs consist of abrasive grain adhered onto the surface of a cloth, film, paper, non-woven or other backing. They are used for metal removal, surface finishing, sanding, etc. Abrasive grain and finishing media includes crushed grit, metal shot, glass beads or shaped chips for blasting, mass finishing (vibratory or tumbling), bonded wheels, coated abrasives and other applications. Abrasive, grinding and finishing accessories include holders, back-up pads, mandrels, contact wheels, polishing naps and other components used to apply abrasive products. Abrasive sheets, rolls or pads consists of abrasive grain adhered onto the surface of a cloth, film, paper, non-woven, sponge or other backing usually with a die cut square or rectangular shape. Ball Milling and Grinding Media designed for ball milling or grinding down of bulk, powder or granular materials into finer powder forms or disperse pigments in a resin or coating. Blast media and blasting abrasives are consumables used in surface preparation processes, such as sandblasting and peening. Coated abrasives are substances used for abrading, smoothing, or polishing. Contact wheels drive and provide back up support for abrasive belts. They are available in a variety of face profiles, materials and diameters. 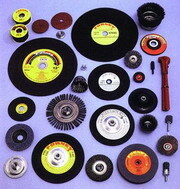 Diamond tools and wheel dressers are used to condition, true and dress grinding wheels. Dressing is the process of re-sharpening the tiny cutting edges on a grinding wheel’s surface. Flap wheels and specialty abrasives includes cartridge rolls, cross pads, sleeves, unitized or convolute wheels, interleaved flaps, flap discs and other specialized abrasive products converted from coated or nonwoven abrasives. Lapping and polishing compounds are used to improve surface finish or flatness. Finishing compounds consist of fine abrasives in slurry, bar, powder or paste forms. Lapping tools are used for precision surface finishing, often in conjunction with loose abrasive compounds. Non-woven surface conditioning abrasives consist of abrasive grains adhered with resin to the internal fiber surfaces of a non-woven textile backing. Sharpening stones and honing tools are used for sharpening edges and honing internal or external surfaces. They are generally stones or bonded abrasive product with a rectangular block or shaped stick configuration. Superabrasives and diamond wheels consist of grinding wheels, abrasive saw blades, wheel dressers, single point tools and other products utilizing diamond or cubic boron nitride (CBN) abrasive grain. Surface grinding segments are bonded abrasive structures that can be assembled on a special form to create a large wheel for flat surface grinding. Tumbling and mass finishing media is used to debur, burnish, color, de-scale, polish or clean during finishing processes. Bangkok Companies is a full service product sourcing company in Thailand. For your abrasive products please email bangkokcompanies@gmail.com with your requests. Bangkok Companies has a comprehensive contact database of Thai abrasive companies, Thailand abrasive companies and abrasive products. We are one of the leading abrasive manufacture and distributor in Thailand. Our company has joint venture with Japanese company (NCA) in Thailand. Fulong Industry Co., Ltd. Has been established since 1980, we are a leading manufacturer of Reinforced Resinoid (Resin Bond) Grinding Wheel & Cutting Wheel in Thailand under the trademark of "MORRITA", "BIGBON", "SUNBIRD" & "FI-FLEX" brand, our factory is located in Chonburi Province with over 15, 000 square meters plant area, and with 2, 000 MT. Production capacity per year. Mitsuya limited is located in Thailand since 1992. Main products and services are grinding wheels, diamond tools, barreling media and machinery, coated abrasives, cut-off wheels, polishing products and metalworking products. Mounted Point Grinding Wheels . P & P Trading (Thailand) Co.,Ltd. T.P.T. Group Trading And Service Co.,Ltd.